I had my first Thanksgiving dinner back in 2012 at my soon-to-be in-laws’ place. It was truly a unique experience for me. I tried many dishes for the first time in my life, such as homemade roast turkey, pumpkin pie, green beans in cream sauce, and sweet potato casserole. I still remember how great the food was and the fact that I could barely walk after feasting all day. Yep, one of our family traditions includes snacking on Thanksgiving turkey from the morning, because we always roast two turkeys. After getting married and moving to the US in 2015, I’ve had quite a few Thanksgiving dinners. 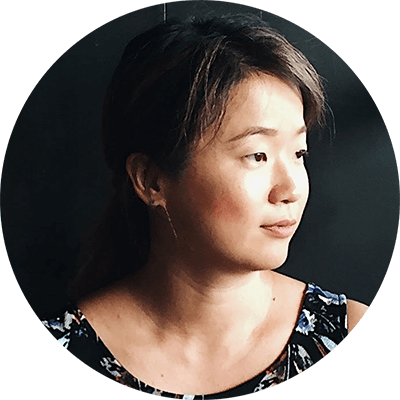 But it wasn’t until recent years that I finally gathered the courage to challenge myself to bring some new ideas to our once-a-year family gathering. In the past years I’ve shared some Thanksgiving recipes with some Asian elements, such as the Chinese Brined Turkey and Kabocha Pumpkin Pie. 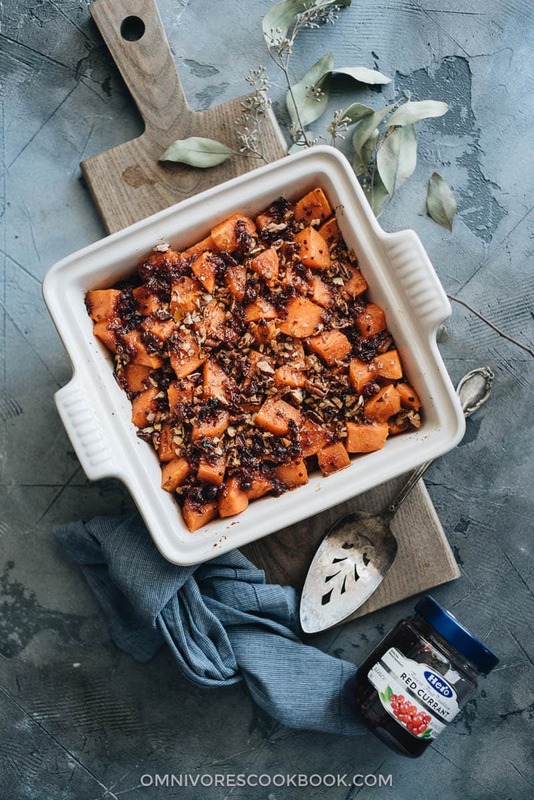 This year, I wanted to develop a recipe using one of my favorite ingredients – sweet potato. Despite the fact that I love the traditional sweet potato casserole, the original dish is a tad too sweet and heavy for my taste. After excessive amounts of turkey, extra creamy mashed potatoes, roast goose, and before the pies, I simply cannot find room for a serving of extra sugary sweet potatoes. That’s why I wanted to make a lighter and fruitier sweet potato casserole, which is less sweet and a bit more savory. I love the texture of the sweet potato by itself, so I simply roasted them and cubed them before putting them into the casserole. 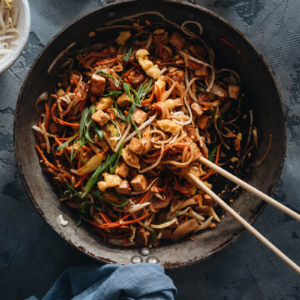 It makes the dish much lighter and healthier. It reduces the cooking time, as well. Although I always like roasting the sweet potatoes to bring out their great flavor, you can simply boil them on the stovetop if your oven is occupied. It takes 15 to 20 minutes to cook them through, and maybe a few more minutes if your potatoes are on the larger side. 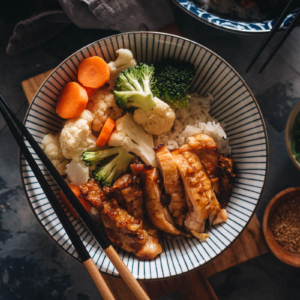 I mixed some miso paste and coconut oil into the glaze to create a creamy, rich sauce that is very fruity and slightly savory. I also added a dash of cinnamon and cayenne pepper, so it tastes like Thanksgiving. 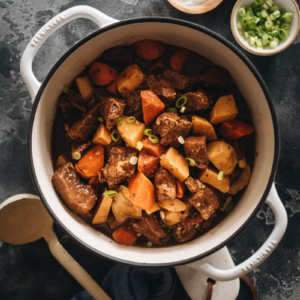 With a handful of chopped pecans, the sweet potato chunks are coated with a thin layer of goodness that is just enough to bring out the great taste without being overpowering. You can find Hero Fruit Spread in the jam aisle of major grocery stores such as ShopRite, Stop & Shop, Walmart, ACME, King Kullen, Key Food, Kings, Balducci’s, Fairway, Shaw’s, Market Basket, Price Chopper, Gelsons, Earth Fare, Wegmans, Ralph’s, HEB, and Giant Eagle. 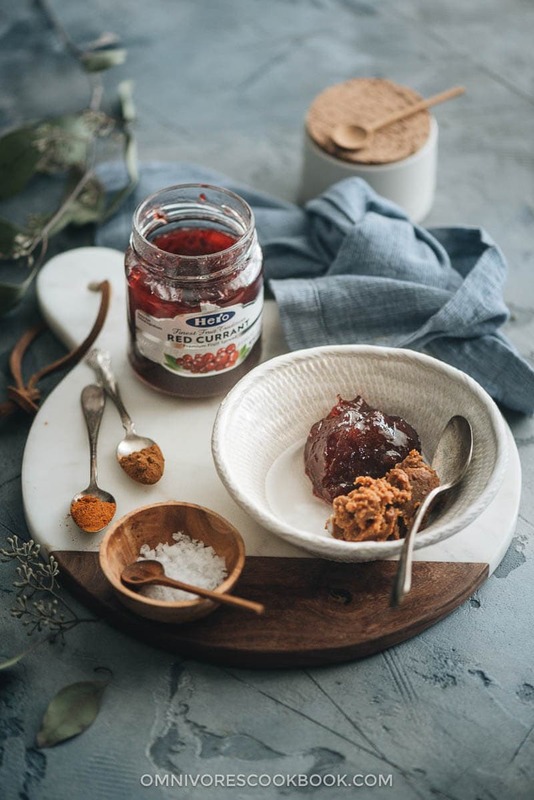 If you have extra fruit spread after cooking the dish, be sure to check out the Hero Fruit Spread recipe page to explore fun ideas and get inspired. That’s it! 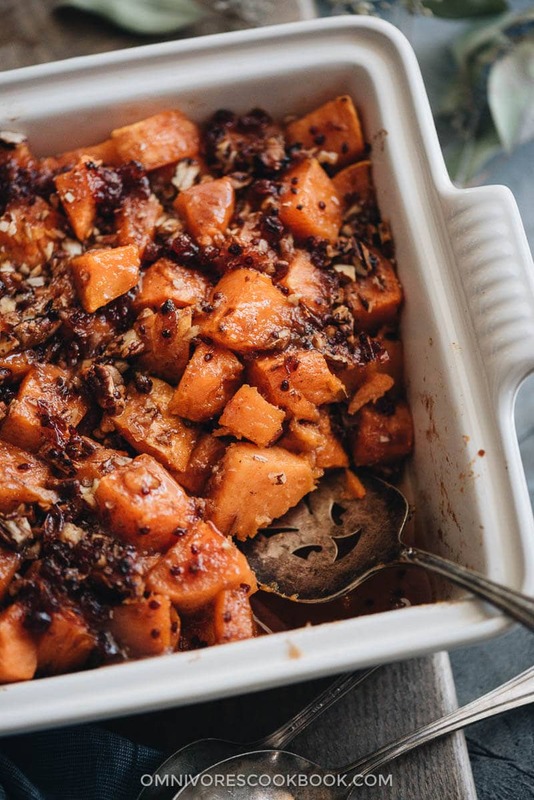 Try out this easier, lighter, and tastier sweet potato casserole recipe for your holiday dinner. I hope you enjoy it and have a wonderful holiday season. 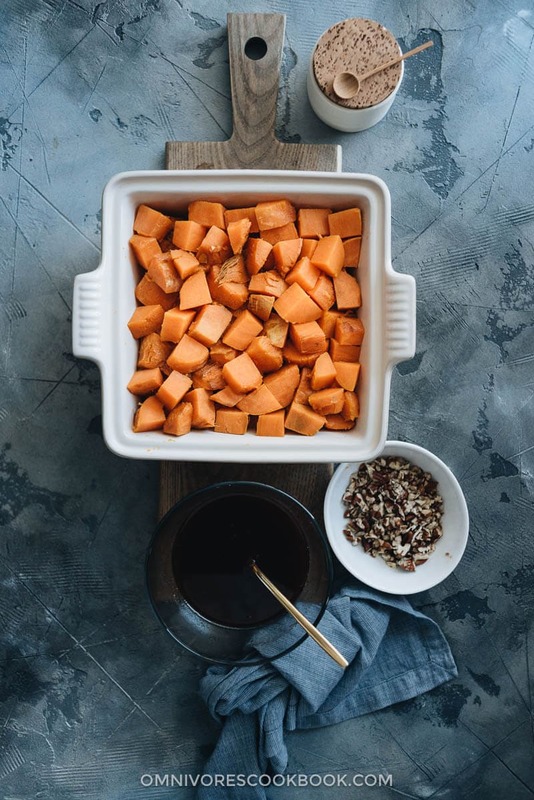 Place the sweet potatoes on a parchment-lined baking sheet and bake until tender throughout, about 1 hour or slightly longer if you’re using large sweet potatoes. Alternatively you can boil the sweet potatoes on the stovetop for 20 minutes. Transfer the sweet potatoes to a plate to cool, until you can handle them with your hands. 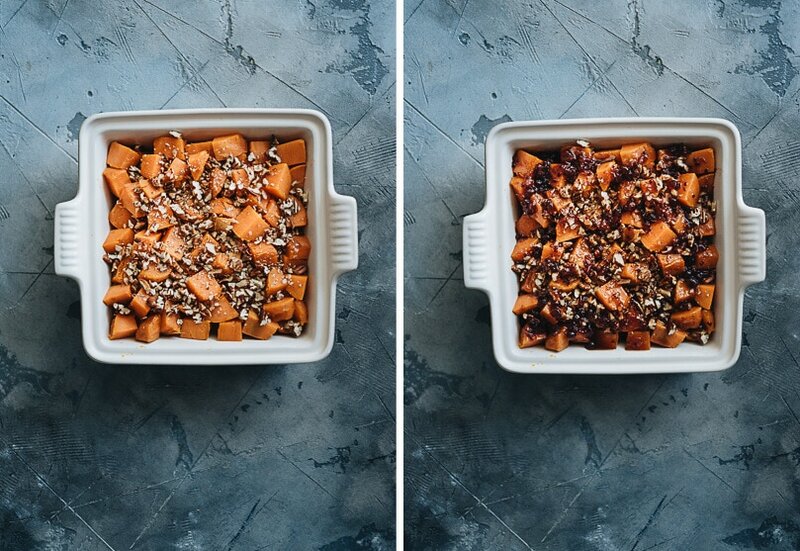 Peel the sweet potatoes and chop them into 1” (1.5 cm) cubes. 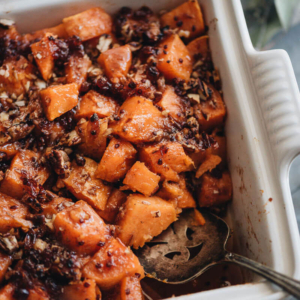 Add the sweet potatoes into a 9x9” casserole dish. 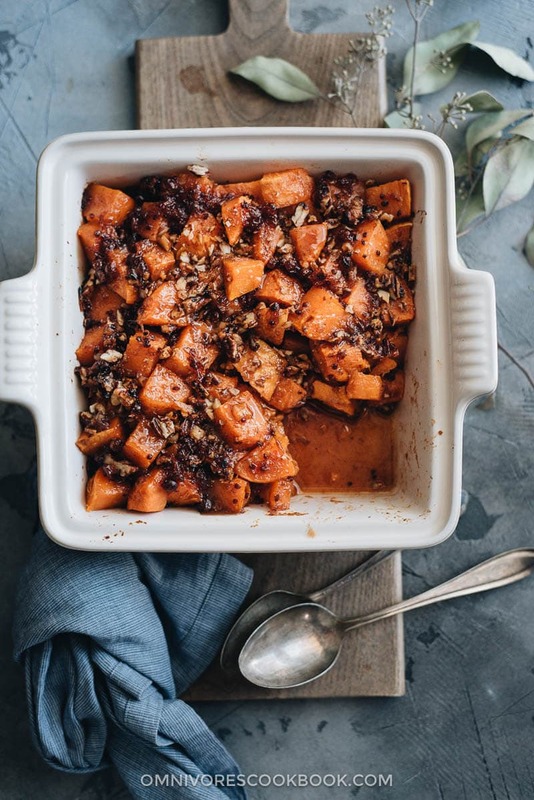 While allowing the sweet potatoes to cool, whisk together all the ingredients for the glaze, except the water, in a medium-sized bowl. Break up the miso paste and fruit spread with a spoon to form a smooth paste. Heat the bowl in the microwave for 30 seconds. Whisk again until the ingredients are evenly combined. Add the water and heat in the microwave for another 30 seconds. Whisk again to mix well. Evenly sprinkle the pecans on top of the sweet potatoes. Pour the red currant miso sauce over the sweet potatoes and pecans. Bake for 20 minutes, or until the sweet potatoes are heated through and the toppings caramelized.